Gibbs Hybrid is a globally diverse, woman-owned (WBE) and ethnic minority-owned (EMB) certified business. Diversity starts from the top! We are an equal opportunities employer and are committed to supporting our client’s ongoing diversity initiatives. We truly believe that it starts from the top and our passion is to promote a positive message and encourage people from all walks of life to achieve their full potential. Our long-term aim is that the composition of our workforce and that of our clients should reflect that of the community. We make a huge effort to identify and engage groups in the community that are considered to be underrepresented in the workforce. Where necessary, special steps, as permitted by the relevant Acts of Parliament, will be taken to help disadvantaged and/or underrepresented groups to compete for jobs on a genuine basis of equality. 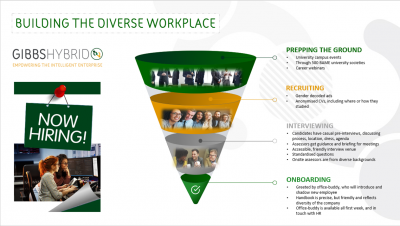 Our internal diversity policy covers all aspects of employment, from vacancy advertising, selection, recruitment and training and development. Not only are we passionate about diversity and inclusion in the workplace, but we also realise the importance of supplier diversity and by having a diverse supplier base, businesses and corporate firms are more likely to mirror their customer base. We realise supplier diversity endorses innovation through the arrival of new products and services. At Gibbs, we are committed to supporting diverse suppliers to help achieve their ambitions. We are proud to be a Chartered Partner to MSDUK and Corporate Member of WEConnect. Our status as a WBE & MBE means partnering with us will not only reduce your business challenges it means your diversity spend will increase too.